Metalsmithing Made Easy, by Kate Ferrant Richbourg and published by Interweave, is for the home jeweler who perhaps has only a small space to work and a little experience with metal. If you want to up your game and conquer some new metal skills, this is where you start. Know first, though, that you will not be able to do that simply by reading this book, but by making a commitment to work your way through it! Before the projects, Kate first covers some very important information. She discusses at some length studio setup, designed for a small space. There is an entire chapter devoted to soldering with a torch (NOT a soldering iron), covering the types of torches and solder, and the how to's. 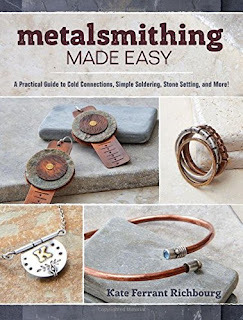 Tools are discussed, the minimum array, and the additions you'll need for specific project (like rings), and Kate also covers metals and materials, including stones and patinas. And finally, there is a discussion on rotary tools, for the time when you decide you need to speed up some of the process. Unique to this book is a chapter titled "Samplers." What a brilliant idea! Here you will find little practice pieces that allow you to try out the new techniques before committing time, energy, and money into a full-blown project (which comes in the next chapter!). There are 15 beautiful projects, arranged in order of increasing difficulty. Some have cold joins, many use simple soldering. All are in Kate's style, but are easily adaptable to your own -- shiny instead of matte, different patinas, textured or stamped to suit you. Some design alternatives are included to help you get going on your own unique adventure.